access to urgent care will be by telephone appointment only. 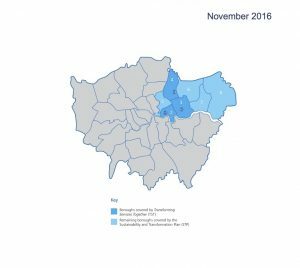 A new report by the Centre for Health and the Public Interest (CHPI)  reveals the draft plans contained in ‘Transforming Services Together’, which the North East London STP has committed to implementing in its latest draft. The planners predict that by 2020/21 the deficit for East London’s NHS will be £398m, a more than threefold increase over the £108m deficit in 2015/16. To close this deficit the local Clinical Commissioning Groups (CCGs) and hospitals have been forced to propose drastic changes to the local NHS. As well as a major cut in the proportion of patients treated in hospital, the primary and community care workforce will be radically reconfigured. It is unlikely that the shortfall of GPs can be replaced with enough lower-paid staff (nurses, physician associates, pharmacists) when the pay of such is below the minimum income level need to live in London. Already the staff turnover rate is 15% and 13% of nursing posts are unfilled. It is uncertain whether these staff can handle the increasingly complex workload being shifted out of A&E. The plans call for £173m to be spent over the next five years to transform buildings and patient records but it is unlikely that this will be available. Over the full ten years, from now to 2026, the amount of investment needed rises further by £463m. Expecting 90% of patients to book appointments for urgent care online or by phone is testing in an area with high levels of English as a second language, a population turnover of 28% a year, and where only 42% of over-60s have internet access. The Centre for Health and the Public Interest is an independent think-tank. The Centre aims to ensure the policy debate on health and social care is more varied, more evidence-based and more open and accessible to citizens. Vivek Kotecha is a Research Officer at the CHPI. He previously worked as a manager in Monitor and NHS Improvement analysing and reporting on the operational and financial performance of the hospital provider sector. Prior to that he worked as a management consultant at Deloitte for 4 years. Vivek holds a BSc Economics (Hons) from the LSE and is a chartered accountant. He is currently studying for a MSc Economics at the University of London.